How many calories in sesame seeds? See below, the sesame seed calories for the different serving sizes. We provide you with sesame seed nutrition facts and the health benefits of sesame seeds to help you lose weight and eat a healthy diet. 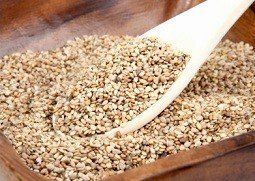 Grown from the sesame plant, sesame seeds are widely used in cooking, either whole or mashed, or used to make sesame oil. Sesame Seeds are high in both poly and mono unsaturated fats (good fat). They are full of protein, fiber and other nutrients, including calcium, magnesium, copper, phosphorus and potassium. They are also good for vitamin E and thiamine (vitamin B1). Sesame is good for lowering cholesterol as they contain phytosterols. Sesame seeds also contain sesamin, which is a lignan that acts like an antioxidant which have been shown to be beneficial to lowering blood pressure and cholesterol. With its high copper content, the seeds are thought to provide relief from arthritis. Other sesame seed benefits include good bone health. The combination of fiber and healthy fat makes seeds a great food for weight loss and weight management. It may surprise you that nuts and seeds are fat burning foods, as they contain a lot of good fat. Compare calories in sesame seeds with the other calories in nuts and seeds.